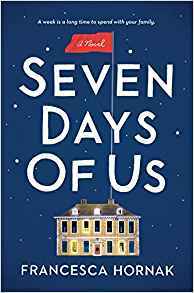 SEVEN DAYS OF US by Francesca Hornack - review will be on November 7 - finished October 16. THE STOLEN MARRIAGE by Diane Chamberlain - review is in the book's title - finished October 10. MILLARD SALTER'S LAST DAY by Jacob M. Appel - review will be on November 3 - finished October 6. THE IT GIRLS by Karen Harper - review will be tomorrow - finished September 26. TAHOE PAYBACK by Todd Borg - review will be on November 1. POISON by Galt Niederhoffer - review will be on November 29. DONE RUNNING by Helen Bea Kirk - review will be on December 12. Nice! New to me ones as usual! Hope you enjoy your reads for the week as well! You're reading some good books. I like the look of The English Wife. Enjoy your reading week! Oh yes...I am very happy with all my books. I'll be interested to see your review of Seven Days of Us. It wasn't a favorite of mine! Also looking forward to seeing your thoughts on Millard Salter! Have a lovely week! It took a bit to get into SEVEN DAYS OF US, but I liked it as I continued to read. I never read A MAN CALLED OVE, but from what comments I have read, Millard is a bit different from Ove. Oh our reading lists overlap a lot, but I'm really behind in my reading after 2 slow weeks. Great to hear we have similar tastes, Beth. Lots of great books here. Not That I Could Tell looks interesting. I hope you enjoy your books. I am looking forward to reading ALL of them. They all sound so good. I have seen a lot of great comments about NOT THAT I COULD TELL. You have so many books that I want! And some that I have, like Poison, The Wife Between Us, and Seven Days of Us. Sunburn and The Woman in the Window are on my wish list. Enjoy! Thanks for sharing, and for visiting my blog. I hope you get the books you want, Laurel. Nice assortment of books. I just got a review copy of The English Wife and can't wait until it reaches the top of my review stack. Come see my week here. Happy reading! It is difficult to wait to read some of these, and THE ENGLISH WIFE does sound so good. Book you are reading has a gothic looking cover. Hope it is keeping you on the edge of your seat! It is a murder mystery. You would LOVE his books, Kathryn. Thank you, pussreboots, and thanks for commenting.